I really have no clue about the Harley biker culture, only observing it from the periphery, once a year at the ROT Rally. But it seems to me that the black leather wearing tribe share a strong camaraderie. Traditional group designators such as gender and race appear to take a back seat to the interests of the Harley world. If true, I think it’s wonderful. It’s a way for people of different backgrounds, sharing a common interest, to get to know each other better. I’ve seen Hispanic, African-American and Caucasian bikers all bond and appreciate each other’s rides. Here’s a scene from 6th Street, before the ROT Rally parade. More than the parade, it’s the street photography, before hand, that really interests me. 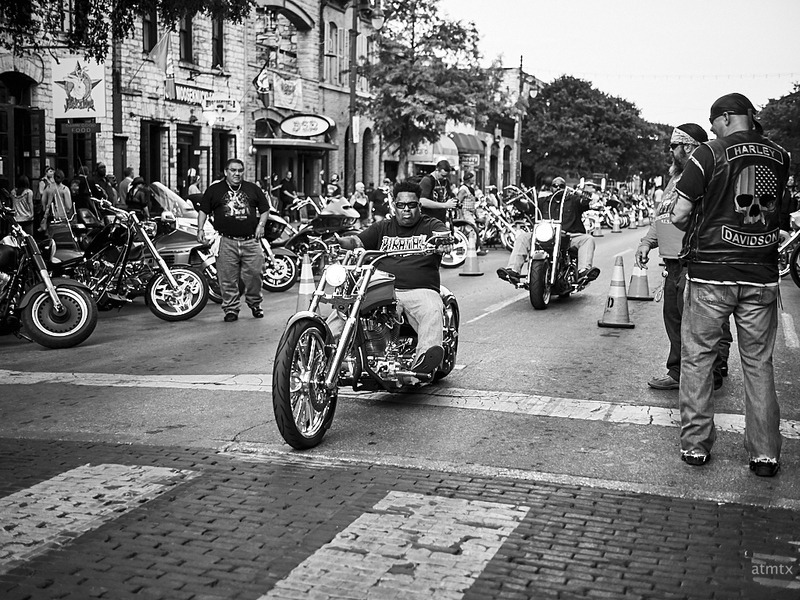 The energy created by the Rally further energizes an already photo-worthy 6th Street. More to come, from the street. Not really about the Harley brand, although its owners do tend to show a great deal of brand pride and loyalty. It’s more about the bike, whatever the brand, and the ride for most of us. That’s actually not a Harley he’s riding. Thanks for the insight, Mike. Yeah, I’m not too familiar with the different bikes. I’m assuming Harley doesn’t make those pocket rocket type bikes, but everything else, I tend to lump together. I do like them for their artistry. Some are quite beautiful.